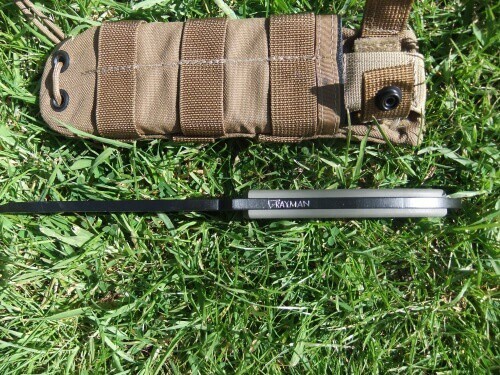 This is my review on the Grayman Knives Ground Pounder knife, but firstly a bit about Grayman Knives. Grayman Knives are small husband and wife company in the US. Sue does the website and orders etc and Mike designs and makes the knives. All Grayman fixed blades are hand ground by Mike and made in the USA. Initially Grayman knives were only available to the military and law enforcement, but as Mike slowed down on other projects, it freed up more time to for knife making and they made their knives available to everyone. Back to the Ground Pounder! Firstly in case you were wondering, it is called the Ground Pounder in honor of the US Military’s ground forces. I’ll give you the knife’s specifications here and then I’ll give you my thoughts, opinion and conclusion below the photos. The Ground Pounder is 1 3/4 inch wide with a 6 inch blade, 12 inches in length overall. It is made from 1/4 inch thick 1095 steel with a black DuraCoat finish. 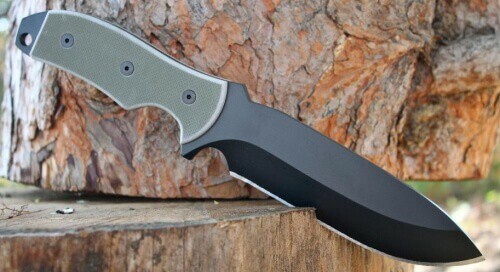 It has a heavy duty textured G10 handle (available in green or black). The knife has a drop-point tip, it has a single bevel and ships with what Mike refers to as a ‘toothy working edge’ (more on these later). 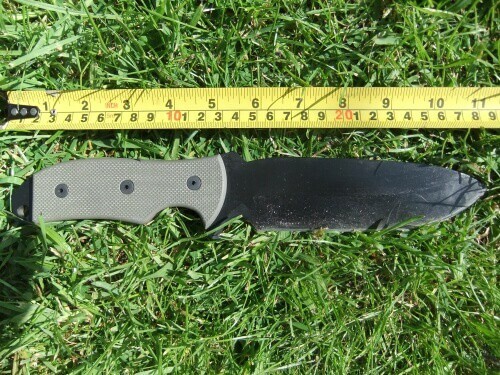 The Grayman Knives Ground Pounder is a big, heavy duty knife, that is designed and made to be used. It is a very serious knife, if I had to choose one word to describe it is would be ‘hefty’. It”s a hefty knife that wants to cut, chop and pry all day long. If I had to survive in the wilderness and I could take just one tool with me, it would be a knife like this (actually it would be this knife!). I have had this knife for several weeks and I have used it for many different things, I have used it to cut all manner of material; I have chopped branches, batoned wood for fires and made feather sticks. I even did some digging with it! The knife’s biggest strength is its only weakness. It is one big, heavy-duty knife that wants to be abused. It is a jack of all trade, but also a master of most of them as well. The weakness is the size, it is just too big to be great for really nimble/delicate tasks. That said the well designed choil does make the knife a lot more nimble for its size. Quality and dependability aside, the unique thing about the Ground Pounder is that its blade is ‘single bevel’, this means the blade edge is ground on only one side (most knives are ground on both sides), similar to a chisel, actually it is sometimes referred to as a ‘chisel grind’. There is a more in-depth explanation on single bevel grind and why it is used on the Grayman Knives website. I really like this feature as it makes sharpening the knife much quicker and easier when you are away from home or base camp. I also found that the the single bevel design actually aids branch chopping etc. I think it is as much to do with the 1095 carbon steel used to make the knife, as it is the single bevel edge, but with a bit of work this knife can be made scary sharp! Additionally I found it remained sharp for quite some time. The Ground Pounder ships with what Mike refers to as a ‘toothy working edge’. It is basically a more aggressive, raspy edge with tiny rough ridges. Personally this edge was not for me. I can totally see why it would be great for military heavy duty use etc, but I didn’t find it ideal for finer tasks such as making feather sticks. I actually ended up sharpening it out to a finer edge, which I felt was much sharper, but to be honest, this is all just personal taste. You might love the ‘toothy working edge’, but if not, you can sharpen the knife, it’s not an issue. I wasn’t sure if I was going to be a fan of the DuraCoat finish, but it has held up really well. It protects the steel against rust and it makes the knife easy to clean. It also stops the knife reflecting light if you are in a covert situation, although this works in reverse if you are in a survival situation, as you cannot use the knife blade for signalling for help etc. The G10 handle is comfortable and has great grip. One thing I would say is it’s a big old handle and I don’t think it would be that comfortable for folks with smaller hands. In front of the handle is a choil, which is an excellent feature as it enables you to have much better control over the blade for more precise/delicate tasks. 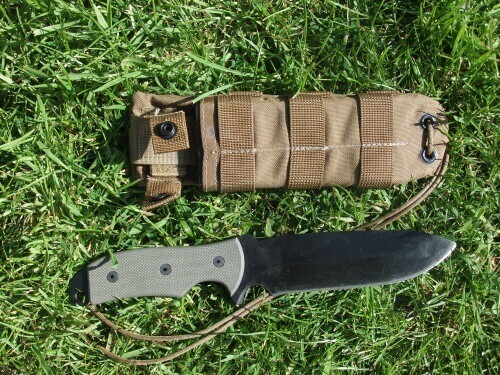 The cordura sheath has a kydex insert and it’s MOLLE/belt compatible. It’s not pretty, but it does what it is supposed to do – it holds and protects the knife (and you!) very well. The webbing makes it very easy to attach to a pack which is a great feature. I get emails all the time asking for me to recommend knives for bug-out-bags and for wilderness survival. Typically people ask – what one knife would you recommend for my pack, that is dependable and has multiple uses, so it will save me carrying several tools? I am by no means an expert on knives, but it seemed that all the knives I have had experience of, have some kind of limitation. With this in mind I set about finding a ‘one knife for every situation’ that could cover all bases in a survival situation. This was when I stumbled across Grayman Knives and I was immediately drawn to the Ground Pounder and that leads us to where we are today. I already liked the look of the Ground Pounder which is why I got hold of one to review. I have high expectations for my gear and tools and I think the Ground Pounder is as close as you will get to a one knife for every task in survival situations. It excels at the hard tasks of cutting, chopping, digging and prying, but largely due to the well implemented choil, it can tackle the finer tasks as well. It is not as good at the finer tasks, but you can get them done with a bit more time and care. You are never going to get a tool that can chop wood, hack down branches and dig holes, that is also great for carving, dressing game and preparing food. To be honest, I’ll also carry a smaller folding knife for preparing food etc, and I would recommend doing this, BUT you don’t absolutely need to. If you don’t want to carry a separate machete, hatchet, entrenching tool and knife, then the Grayman Knives Ground Pounder could be the tool for you. It excels at the tough work and yet still just about manages to be nimble enough to get the finer tasks accomplished as well. If you only want to carry one tool, this is that tool! The Ground Pounder comes with several different blade choices. The one featured here is the single bevel, single edge option and it currently costs $195. Yes, this is a sizeable amount of money, but each knife is hand ground and made in the US by Mike, and if you purchase one, the money you spend is an investment rather than a cost, as you are investing in a knife that will have your back and won’t let you down, no matter what situation you find yourself in, for the rest of your life… Another thing to bear in mind is – if you are considering purchasing this knife for a bug-out-bag or survival kit and you want to travel light, having this knife saves you the cost of having to purchase a separate machete, hatchet and possible an entrenching tool. Finally, there is also the Grayman Knives fixed blade warranty: “Free sharpening anytime. You pay postage, and I’ll sharpen her up and send her right back. If you break it (yeah right) send it back and I’ll fix or replace it post haste. If you sell it, give it away, or will it to a family member or fave charity, the warranty goes with it.” You can’t ask for much more! 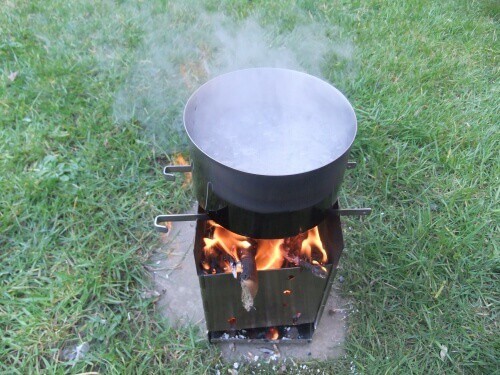 These stoves are easily made and work very well, in an emergency situation you could make one of these stoves and cook or boil water so its safe to drink. I really like the design of this one and what more unique is that its not make from a can. This review is on the Kelly Kettle Base Camp model in stainless steel. Kelly Kettles come in three different sizes, with some made from aluminium and some made from stainless steel. The Base Camp model is the largest in the range, but other than their size, all of the other Kelly Kettles perform in the same manner. The Kelly Kettle is the original outdoor kettle. The first Kelly Kettle was developed in the 1890s by the great grand-father of the current company directors. 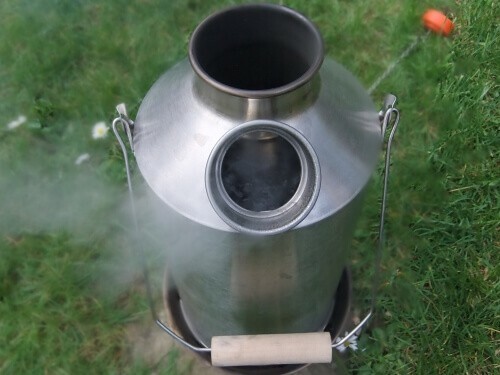 These days the Kelly Kettle is often imitated, but never bettered. You might find a cheaper alternative, but the build quality of the Kelly Kettle is so good, it will likely last you a lifetime. You’ll probably end up handing it down to your kids.. 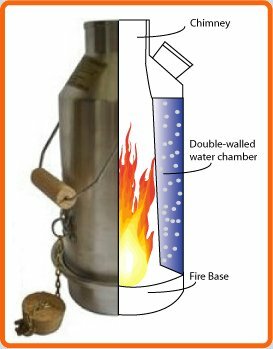 So what does the Kelly Kettle do that makes it so unique? Well firstly, check out the image below which shows how the kettle works. It is simple, yet genius! As you can see, I simply used some cardboard to light the fire. I put the kettle on the base, dropped several pine cones down the chimney and lit the fire via the small hole (just about visible in the photo below) in the fire base. A few more pine cones and seven minutes later I had 1.5 litres of boiling water! Aside from boiling water, there are also some accessories available which allow you to cook on the Kelly Kettle. 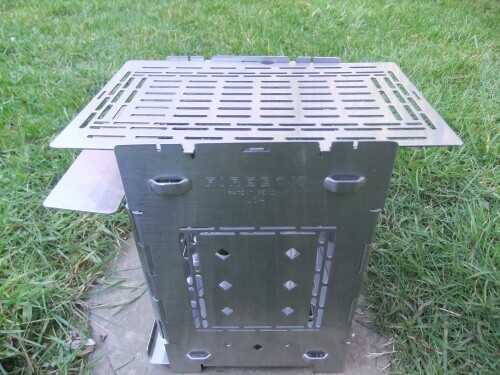 There is the pot support (above) and the the two piece fire base grill (below). Now these are great additions, but they don’t come as standard, but I would recommend purchasing both. However there are limitations. Firstly, if you will be using the Kelly Kettle for cooking on, it is recommended that you purchase the stainless steel version as it is more durable and heat resistant than the aluminium version. 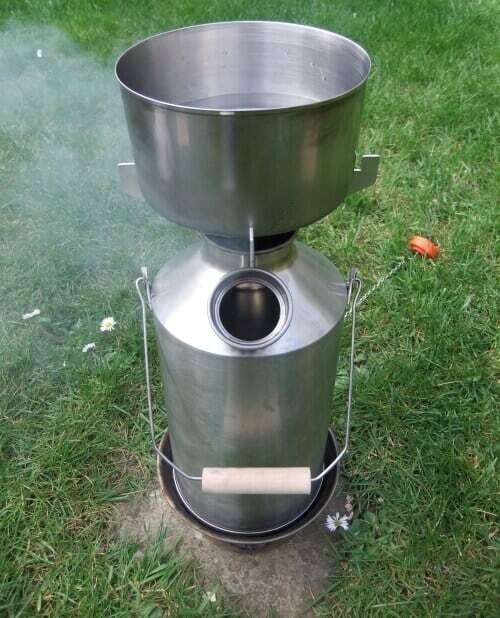 The second limitation is that it is stated that you should only really use the Kelly Kettle for cooking quick meals such as noodles, oatmeal, eggs, sausages and bacon etc. This is because the kettle needs to have water in it when in use. If you use it for cooking on without having water in it, you will damage it. So basically you have five to ten minutes of cooking time using the pot support on the top of the kettle, but if your food isn’t cooked in this time, you can remove the kettle from the fire base and add the grill attachment and finish off your food on there. I discussed cooking with Patrick, one of the directors at Kelly Kettle, and he explained that cooking on the kettles is a relatively new thing, with historically the main purpose of the kettles being to boil water in super quick time. When cooking noodles etc on the top of the kettle, first boil some water which can be poured over the noodles to speed up cooking time. You can then refill the kettle and cook them before it boils again. If you want to continue cooking on the top of the Kelly Kettle after the water has boiled, it is ok (with caution!) 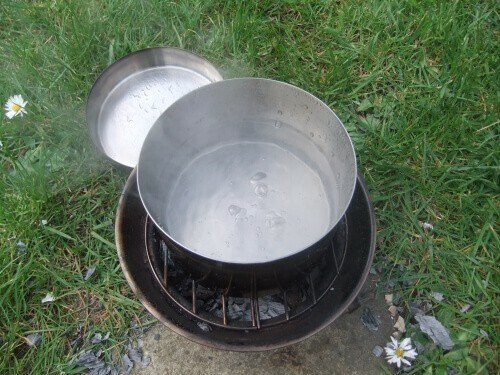 to continue cooking for a short period, with the water continuing to boil. The Kelly Kettle has been around for over a 100 years and it is probably more popular now than it has ever been. 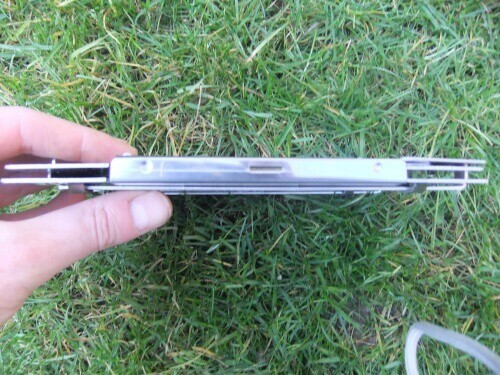 There is a reason for this – it is a very well made, high quality bit of kit that boils water outdoors faster than any other reasonable method. I would give it 10/10 for build quality and 10/10 for its main ability of boiling water. I would give it 7/10 for cooking on, but we need to remember that cooking is the Kelly Kettle’s secondary use, and as long as you are aware of the limitations, it is perfectly fine. The problem is the kettle is just so efficient at boiling water, it doesn’t give you a great deal of time for cooking! I think the Base Camp Kelly Kettle would be ideal for: fishing, car camping, preparedness, Scouts, picnics and construction sites. Personally I wouldn’t use it for hiking or wilderness camping as it is too big and bulky. That said, the Base Camp is the largest kettle in the range, there is also the Scout Kettle and Trekker Kettle. Another thing to note is that if you purchase the additional pot support and cook set (pan/lid, handle and two piece grill) , these all fit and are stored inside the kettle for storage, so they don’t take up any additional space. Overall, I completely recommend the Kelly Kettle. If you’ve read my review, you understand its strengths and limitations, if you think it suits your needs and you are thinking of getting one, don’t hesitate! It will likely last you a lifetime. Additionally, I have nothing but great things to say about the folks from Kelly Kettle. They couldn’t have been more helpful and friendly. For this review I received a Kelly Kettle Base Camp in stainless steel, which came as part of a kit which included the the pot support, pan/lid, handle, grill and bag. This kit currently retails at $108.99, although you can purchase the kettle alone for $89.99, the aluminium kettles are cheaper again. Kelly Kettles can also be purchased directly from Kelly Kettle (UK, Ireland & Europe) and Kelly Kettle USA. 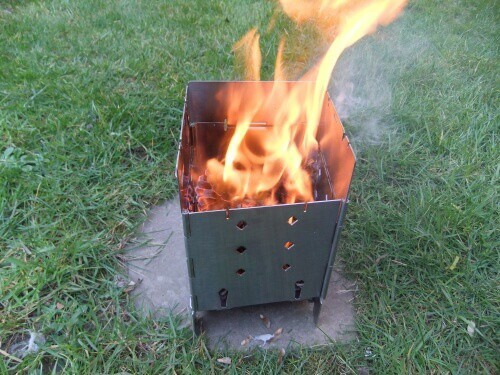 The Folding Firebox Stove is a compact folding stove made from stainless steel. When folded the stove measures just 7.5 inches x 5 inches by 3/8 inch thick and it all fits nicely into a cordura d-ring bag (see the photos above and below). When set up the stove measures 7.5 inches x 5 inches, which is actually a great size for a stove which is so compact when stored. The Folding Firebox Stove is a multi-fuel stove, in that it is designed (and can be configured in slightly different ways) to burn wood/pine cones, solid fuel tablets, gel fuels, wood pellets, charcoal briquettes and it can even fit an alcohol burner. 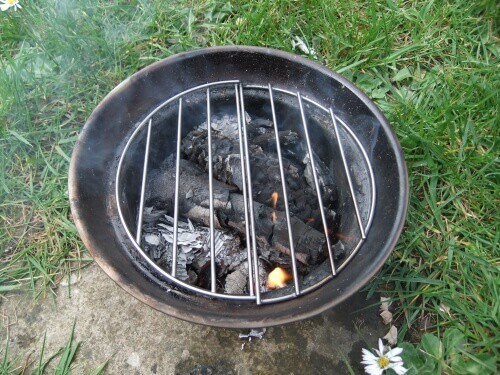 Personally I think it is most useful when used to burn wood/pine cones and charcoal. In the photo above you can see the kit I received to review. It includes: the Folding Firebox (bottom right), the extended grill plate, adjustable fire grate & two extra fire sticks (bottom left), and the heavy duty cordura D-ring bag (top). Everything other than the Folding Firebox stove itself are additional extras, which can be purchased individually or as part of various kit options. The extended grill plate is great as it gives you an expanded grilling surface for grilling/barbecuing meat and fish etc. The plate is 7.5 inches by 5 inches so it is a good size for such a compact stove. The stove boiling water very quickly! 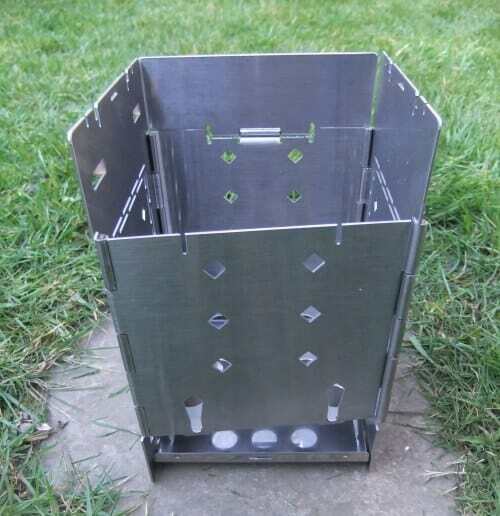 The Folding Firebox stove is very well made, in fact if possible, it might be too well made… The thing is it is made of a heavier gage stainless steel than other camp stoves, this makes it very durable and it won’t ever warp like cheaper stoves made from thinner metals. I can’t see how you would every break or damage this stove. The downside to this is the stove’s weight, it weighs 2lbs which makes it pretty heavy for hiking and wilderness camping etc. That said, I don’t think the weight is a deal breaker, because whilst the stove is quite heavy, you don’t have to carry any additional fuel such as gas canisters etc. Aside from the quality of construction, the stove is also very well designed. Everything is hinged together nicely and falls into place in seconds and then basically the stove is ready to go. You can then configure the stove a few different ways with the fire sticks and adjustable fire grate (added extra). The way the fire sticks work is genius, they are used in various positions for cooking and when you fold up the stove, they slide into some groves and hold the stove folded in place. If as I recommend, you purchase an additional set of fire sticks, they can also be used to pick up the stove and move it when in use, which is a great feature. The Folding Firebox stove is also quite a bit larger than other similar wood burning stoves I have seen, it is easily big enough to cook food for two, possibly even three people depending on what you are cooking. This is due to its size and the fact it is top feeding so you can fit a whole load of fuel into the stove making it capable of cooking much larger portions of food. When I first received the stove I was surprised by its weight, however after using the stove I am blown away by its quality and versatility. 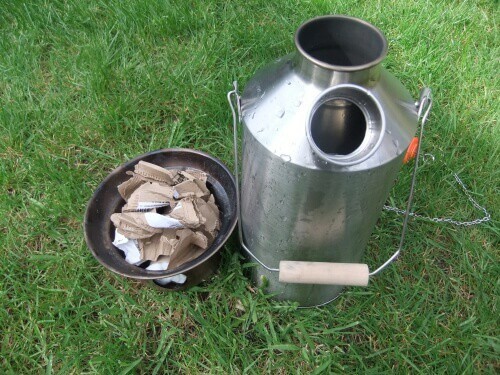 When folded it measures just 7.5 inches x 5 inches by 3/8 inch thick, but when set up due to its large top feeding 7.5 x 5 inch size, it is capable of cooking greater quantities of food than similar portable stoves. I have seen photos online of people using Dutch ovens on Folding Firebox stoves. When you add to this the fact you can burn almost any fuel source on it, it makes the Folding Firebox stove a real winner! Sure the weight will be an issue for some, but I think the stove is a great choice for camping/base camp, fishing/hunting, day trips to the park/beach etc. It is also a great option for preppers for use either at home for power outages etc or for packing in the bug-out-bag or vehicle. The only people I would not recommend this stove to would be light weight/ long distance hikers. Aside from everything I have mentioned so far, the thing I like the most about the Folding Firebox stove is that it allows you to have a fire and cook without scaring the earth or leaving a trace that you have been there. I hate it when people make needless camp-fires everywhere in the wilderness and leave behind scared earth and burned wood etc. Sure, it is fine to have a nice camp-fire at base-camp sometimes, but they are not necessary everywhere and every time. 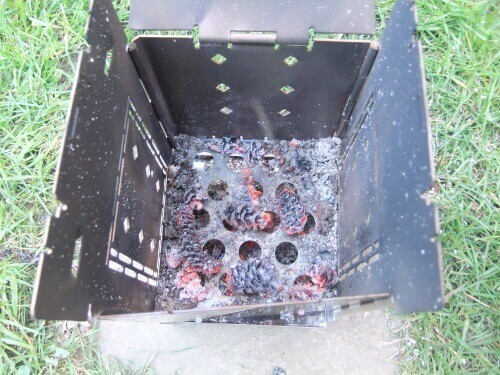 The Folding Firebox allows you to have a fire anywhere you like, without damaging the surrounding environment in any way, and that gets a big tick in the box from me! The bottom line – note the weight, but as far as I am concerned, the Folding Firebox stove is recommended to everyone apart from lightweight/long distance hikers. Mine will be going in my bug-out bag! 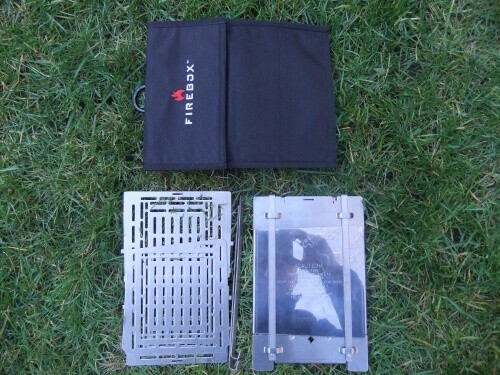 The Folding Firebox stove currently costs $59.99 which includes FREE shipping in the USA. Folding Firebox Stove.com have been kind enough to offer all Knowledge Weighs Nothing visitors a 10% discount. If you don’t enter the discount code kwn (exactly as it is) during checkout, you won’t receive the discount! There is so much marketing focused on getting you to spend your hard earnt dollars ( or pounds) on expensive knives. These companies are very clever at making think you have to spend over $100 to get a knife you can depend on. This is one of my bug-bears. I will spend big if quality dictates the cost, but with knives this isn’t the case, after all we only really talking about a piece of carbon or stainless steel. I have several knives, but do you know which one gets the most use? The $20 Mora knife. Do you know why? Because it is up to the task and as it costs so little, I am not afraid to use it or break it (something I haven’t managed yet!). Sure there are lots of gimmicky cheap knives but these can usually be spotted a mile off. Steer clear of those Rambo knives with the hollow handle for example. 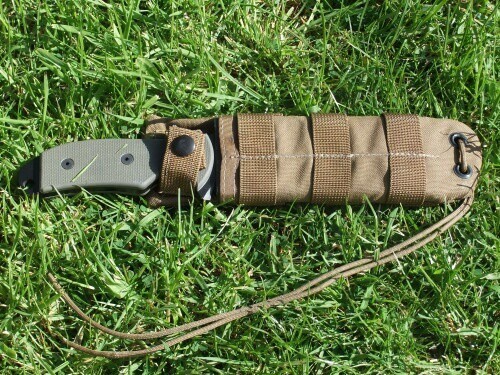 Check out my post: 3 General Survival Knives That Don’t Cost a Fortune you won’t go far wrong with any of these knives. Firstly, this is an entirely unbiased review. I am not being paid for doing this review. outdoorsmen. All ArmourLite watches share the same characteristics, they combine shatter-proof glass, tritium illumination markers (more on tritium in a bit) and solid steel cases (apart from the Isobrite range, which have polycarbon cases). ArmourLite have five different series: Professional; Colorburst; Captain Field; Isobrite; and Women’s. 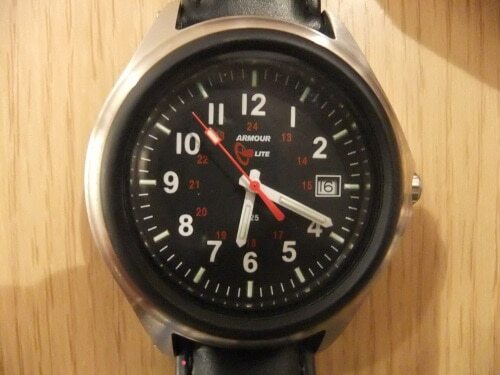 This review is about the ArmourLite Captain Field Series Watch (AL308). AL308 simply refers to the style/strap choice. Apart from appearance and straps, all Captain Field Series watches have the same specification. Firstly a note on the packaging, the watch arrived very well packed. It comes in a great looking leather-like box, which immediately makes you think – ‘hello, this is a high quality item’. 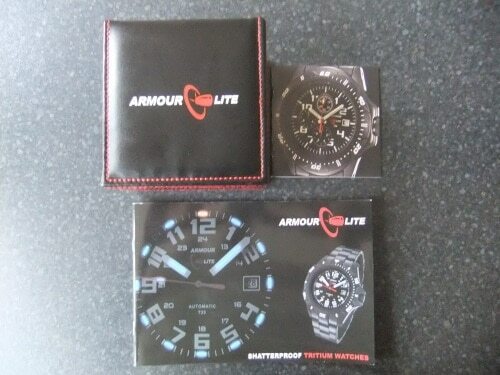 Also included are the instructions and a nice booklet detailing the technology and listing the other ArmourLite watches available. Top marks so far! The thing is, there are other watch manufacturers who make tactical/tough tritium watches, but what ArmourLite did was study these other watches, looked for their weaknesses and then improve on them with their own range of watches. Firstly they worked with a speciality glass manufacturer and came up with a highly scratch resistant glass which is also shatter-proof. Secondly, there is rubber retaining ring that sits under the crystal to absorb shock. Thirdly, all ArmourLite watches are fitted with a rubber bumper around the watch face, which further protects from the watch face from scratches and bumps. Why all high end tactical watches don’t come with a bumper of some kind, or the glass recessed in some way is a complete mystery to me. See my (not great!) close up, where you can see the black bumper around the watch face. Tritium is a natural isotope. One of the main uses of tritium is self-activated lighting using tritium gas in small glass vials. The vials are coated with a very thin layer of phosphorescent powder. The powder allows the energy created by the long-lasting tritium gas to be converted into light. The amazing thing about the tritium gas vial markers is that they remain continuously illuminated for over 20 years. They maintain their illumination right through the night and do not fade like the markers on most watches, so you can rest assured that whatever the light conditions, you’ll be able to tell the time. 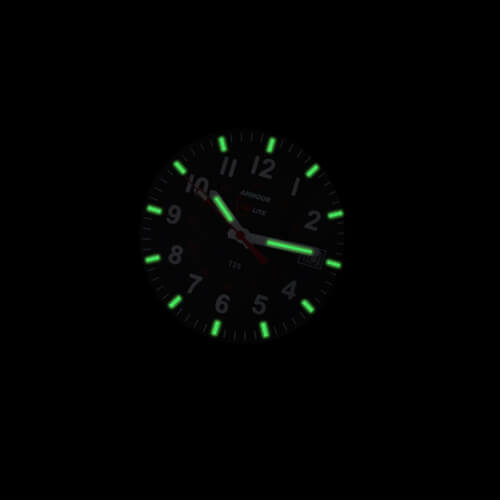 The tritium markers are on each of the hour points and the hour and minute hands. The one little annoyance I have is that on this model, there is no tritium marker on the second hand, instead it has traditional watch illumination which fades over time. To be fair, this is one of the cheaper watches ArmourLite manufacture and most of the more expensive models do have tritium on the second hand, but personally I would have liked to have seen it included here as well. At the end of the day, it is not likely to be vital to be able to see the second hand in the middle of the night, but it is a little annoyance. See the tritium illumination in the dark below. This particular watch has a solid stainless steel case with great detail and some nice branding. I should say that although the case is made from stainless steel, it doesn’t feel heavy on the wrist. The watch is waterproof to 100 meters, which means it is suitable for swimming/snorkling etc. The movement has a Swiss Ronda 715Li Quartz, which is very accurate and well known for its durability and ability to function in demanding conditions. I have tested the watch over the last few weeks and it hasn’t lost a second. Very accurate time keeping. The watch I have has a black leather strap, it is perfectly fine, but nothing spectacular. The Captain Field series comes with either leather or metal straps. This watch has an amazing battery life of 10 years! This is great as this is actually one of the few watches that will still be working and looking great in 10 years time. 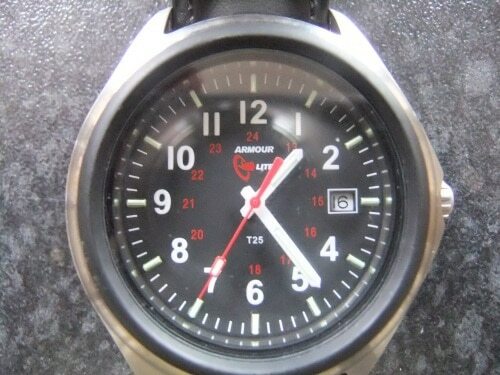 This ArmourLite Captain Field Series Watch (AL308) currently retails at $250.00 with free shipping. I think ArmourLite are an innovative company who design and build watches that are designed to improve upon the weaknesses of their competitor’s watches. What makes them truly amazing is that they usually manage to achieve this whilst still selling their watches at a lower price than many of their rivals, and for that they should be applauded. It would be very easy to say – well my watch is better than that watch, so I am going to charge $100 more for it. ArmourLite haven’t done this, they have stayed true to their roots of providing watches that will last for years and years and that are affordable for law enforcement officers, military personnel, first responders etc. Would I recommend the ArmourLite Captain Field Series Watch (AL308)? HELL YES! Sure, it costs $250, but you are getting a lot of watch for your money. 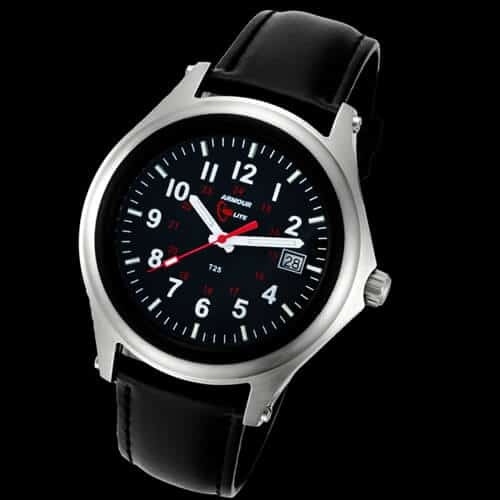 It is bomb-proof, it has amazing tritium illumination, it has an superb battery life of 10 years and a 2 year guarantee. Durability and longevity aside, this is also a great looking, unassuming watch, which suits me fine to be honest. 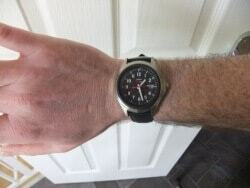 I am fed up with all tactical/tough watches being absolutely huge, with flashy bezels around the watch face. I mean seriously, who honestly ever uses the bezels? The only negative I have to say about this watch is the lack of a tritium marker on the second hand and that’s it. The bottom line – this is a high quality, durable and dependable watch that will out-perform and outlast most other watches in its category At this price range, it has better glass, movement, battery life and guarantee than most of the competitors, so in that respect, it provides much better value for money. If this is the kind of watch you are after, this watch is highly recommended by me. For more information, or if you would like to purchase an ArmourLite watch, head over to the ArmourLite website. Review Update: I have been wearing the Captain Field watch daily for the last month. The watch still looks brand new, there is not a mark on it. The main thing I wanted to update the review about is the timekeeping accuracy of the watch. The accuracy of this watch is phenomenal! I have a radio controlled clock and a radio controlled watch, both are kept 100% accurate by daily updates via radio signal. I synchronized the Captain Field watch to these and over the last month, the watch has gained approximately a second each week, if I round it all off, let’s say it gains one minute a year at this rate. That is phenomenal timekeeping by anyone’s standards. Highly recommended! Firstly, this is an entirely unbiased review. I am not being paid for doing this review. I became aware of the Minimalist Survival Bracelet and its innovative Firestorm buckle (more on that in a minute) and I just knew I had to get hold of one to feature on the website. Wazoo Survival Gear (WSG) are a company based in the US that makes wearable survival kits disguised to blend into your everyday life. Before I get on to the features and what it does, I just want to tell you about the packaging. ‘Wazoo Survival Gear’ have done a awesome job with the packaging. Very minimal, very well branded, excellent information/product features and very importantly, easy to open. So on to the bracelet itself, how is the Minimalist Survival Bracelet different from every other paracord bracelet? Well with a normal paracord bracelet, you just get several feet (dependant on wrist size) of paracord, which is great in itself, but with the Minimalist Survival Bracelet, you get a whole lot more, but without any additional bulk. Firestorm buckle with integrated firesteel and survival whistle. 20 feet of 50lb fishing line which can be used for fishing or snares. A stainless steel name plate which can be used as a striker for the firesteel or a sinker or spinner for fishing. It could also be sharpened as a small blade or possibly used as an improvised signal mirror. Everything apart from the buckle is woven into the bracelet itself and is not visible. Given the weight and bulk of both bracelets is the same, I know which one I would rather be wearing if I was stuck out in the wild. I know what you are thinking how on earth have they managed to fit a firesteel and a whistle into a paracord bracelet, without adding to the bulk? Check out the photo below to see how. Once again I think I know what you are thinking… That firesteel must be tiny and useless (which is what I was concerned about). Well you are right, it is tiny, I’d say it is about 2cm long, but surprisingly enough it does work quite well. After a bit of practise I managed to get consistent sparks and managed to light cotton wool no bother at all. The thing to remember about this firesteel, is it is not supposed to be your main ‘go to’ means of starting a fire, it is for back up, emergency use. Due to its size and where it is located in the buckle, it has obvious limitations, but it does work. If you can use a normal sized firesteel, you should be able to use this one without too much difficulty. I should also mention the whistle, which again whilst being tiny, works well. I am not sure what the Db is but I can testify that it is extremely loud for its size. Another interesting feature with the whistle is a small removable stopper which when removed allows you store small items inside the whistle chamber. You wouldn’t get much in there, but you could definitely fit some charcloth or similar in there. My only concern with using this feature is it can be quite tricky removing the rubber stopper. If you have stored something in the whistle and for example you are injured and need to use the whistle for signalling, the whistle will not function without removing whatever is stored in the chamber, which as said, can be quite tricky to do. The ‘Wazoo Survival Gear’ Minimalist Survival Bracelet currently retails at $29. Yes, this is more expensive than standard paracord bracelets, but I have seen standard paracord bracelets in this price range as well. This is a premium product, with many additional features. I should also add it is made in the USA! The bracelet can be purchased here: wazoosurvivalgear.com I should also note that you can purchase the bracelet unassembled for just $8.00, you get all the components in a bag so you can create your own bracelet. I think the ‘Wazoo Survival Gear’ Minimalist Survival Bracelet is awesome! The Firestorm buckle is one of the most innovative things I have seen in a long while and all together the Minimalist Survival Bracelet is a truly unique product. There are no gimmicks, everything included on the bracelet works as intended. 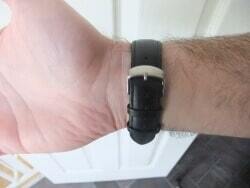 It is amazing the extra features this bracelet manages to fit in, without increasing the bulk in any noticeable way. The bottom line – would I recommend the ‘Wazoo Survival Gear’ Minimalist Survival Bracelet? Absolutely YES! It is a bit more expensive than standard paracord bracelets, but it is a premium USA made product with many additional features and uses. This is a new product to the market, so be one of the first to get one! The great thing about this project is there are no special tools required to make the bow. All you need is a hobby knife or a pocket knife and that’s it. With this in mind it is also a nice little project for the kids. I am not really too sure how powerful or effective a bow like this will be, but I am sure I have seen old Chinese or Japanese bamboo bows made from bamboo lashed together like this. If it worked for them, I can’t see why you can’t build an effective bow with this design, perhaps with some tweaks and adjustments. I have had one of these for years and it is superb. Not only do you get free plant pots, they are also biodegradable and can be planted straight in the ground (in the pot) and the pot will break-down very quickly. 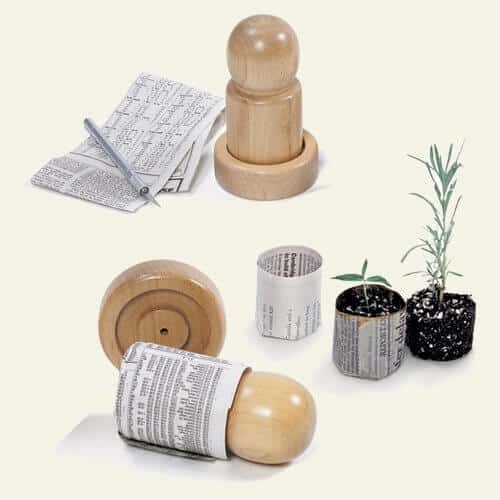 These paper pots are suitable for use with all fruit, vegetables and flowering plants. As they are planted in the ground in the pot, it makes them especially useful for plants which don’t like root disturbance, such as beets and carrots, which allows you to start these off early indoors and get a head start on the growing season. There are no issues with the ink in newspaper and all newspapers are printed with a soy-based ink which is non-toxic. I highly recommend you pick one up, it will last forever and save you a fortune.